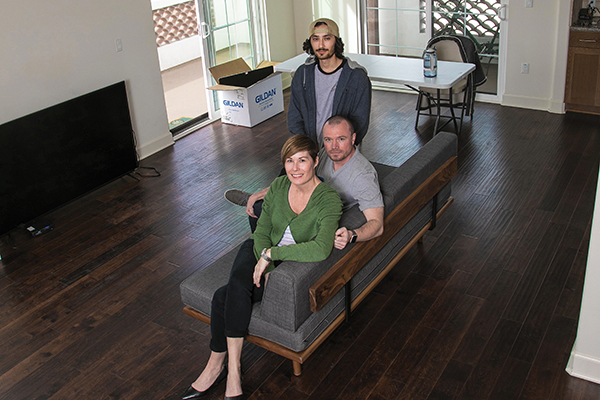 Cary Glenn ’14, Jarrod Poirot and their son, Alex Uribe, lost artworks and other prized objects from Mexico, France and Turkey when their apartment was destroyed by the Thomas Fire. Still, they plan to collect art for the new place in Ventura. When the Hawaiian Village Apartments in downtown Ventura burned to the ground in the early morning hours of Dec. 5, the first night of the Thomas Fire, Cary Glenn ’14 lost her home of five and a half years. Glenn, a city of Ventura employee and graduate in organizational leadership, lived in apartment 28 with her husband, Jarrod Poirot, and her adult son. It was a two-bedroom corner unit with ocean views from every room. The rent was $1,500 per month. They knew they wouldn’t find another $1,500 ocean-view apartment in Ventura, but they were still shocked by what they found. “Anything comparable to what we had was $2,400 to $2,800,” Glenn said. They stayed at a coworker’s friend’s house while looking for a new place. In mid-January, they found a condominium unit for rent in a newer building in West Ventura, a two-bedroom unit for $2,350. They moved in Jan. 19. The Thomas Fire forced Glenn and Poirot into a housing market that was already inhospitable to both renters and buyers, even before the fire destroyed hundreds of homes. In July 2017, the average rent for a two-bedroom apartment in Ventura County was $2,023, according to a semiannual survey by the Ventura real estate firm Dyer Sheehan Group. To afford that average two-bedroom apartment, while spending 35 percent of the household income on rent, a renter would have to make just under $70,000 per year. Things are even grimmer for those who want to buy a home. The median price of a home sold in Ventura County in December 2017 was $580,000, according to the real estate research firm CoreLogic, a 10.5 percent increase over the previous year. In Southern California, only Orange County had a higher median price, and only Santa Barbara County had a higher rate of annual price increases. Only 27 percent of households in Ventura County can afford to pay the median price, according to the affordability index developed by the California Association of Realtors. The result is that young professionals who graduate from CLU or other colleges have little hope of staying in Ventura County if they ever want to own their homes. Smith is a former Ventura city councilman and the current chairman of the Ventura County Economic Development Association. The biggest challenge for economic development in the county, he said – the biggest concern that businesses have when they are considering moving here – is housing affordability for their workers. Without sufficient housing, people overcrowd the housing that is available, Smith said, or they live farther and farther away from their jobs, making traffic even worse. 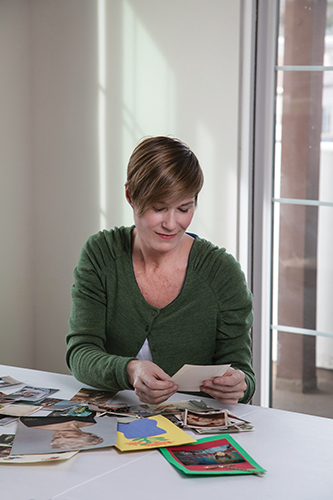 Glenn and her family were able to save precious photographs from the fire. There are a host of reasons for Ventura County’s high rents and home prices, said Kirk Lesh, a real estate economist and an assistant professor at the university’s School of Management. California has a history of boom-and-bust real estate cycles, and we’re now in a boom phase. Ventura County in particular has high demand – due to its climate, natural beauty and quality of life – and limited supply of new housing. Growth control laws make it difficult to build new subdivisions, and construction projects within existing neighborhoods also draw opposition from many residents. Lesh said he thinks the Thomas Fire is going to have an effect on the county’s housing market, driving rents and home prices even higher and apartment vacancy rates even lower. The countywide apartment vacancy rate is around 3 percent, and in Ventura it’s below 2 percent. But reversing, or even slowing, the current acceleration in home prices wouldn’t make everyone happy. More than 60 percent of Ventura County residents are homeowners, which means they’re happy when prices go up. That makes it difficult to build political support for new housing, Lesh said. “There’s a sense that people who own homes look at them as investments, and not just as places to live,” he said. There are signs, though, that public opinion is shifting in favor of more housing. Smith said he’s seen it all over Ventura County, even in notoriously slow-growth cities like Thousand Oaks. The housing crunch has become a major political issue all over the state, with numerous proposals in Sacramento to encourage more building by forcing local governments to loosen their regulations. For example, one recent law makes it legal for owners of many single-family homes to build a “granny flat” unit in their back yards. Local governments, nonprofits and developers are using a variety of tactics to address the problem. One is subsidized affordable housing aimed specifically at people below certain income thresholds. Steve Dwyer ’84 is the executive director of Habitat for Humanity of Ventura County, a builder of subsidized affordable housing. Subsidized housing usually means rental units, but Habitat takes a different tack. Its volunteers and contractors build homes that are bought by qualifying low-income families. There are deed restrictions that keep the home designated for low-income buyers if the original owner sells it. To be eligible for a Habitat home, a family of four in Ventura County must have a household income of no more than $79,900, Dwyer said. “We are working with contributors to our community, families who are working hard to have stability and yet don’t have careers that offer the opportunity to buy a home here,” he said. For example, one family that Habitat is building for in Oxnard consists of a city employee and a worker at the Port of Hueneme. urban neighborhoods, often in buildings that have commercial tenants on the ground floors. No city in Ventura County has growth control laws as strict as those in Thousand Oaks, where a measure approved by voters in 1996 put a cap on the number of units that could ever be built in the city. Since then, the city has added about 5,000 units of new housing, and the population has grown by just 9 percent over 21 years. But even in Thousand Oaks, developers are building, and their focus is on mixed-use infill projects in the downtown core, along Thousand Oaks Boulevard. There is a 36-unit, mixed-use building now under construction in downtown Thousand Oaks, and two more buildings in the planning phase with a combined 249 units, said Mark Towne, the city’s community development director. All of them have some units set aside as subsidized affordable housing. Lesh, the real estate economist, said “building up” is a potential solution to the affordable housing crisis, but one that Ventura County residents may not accept. There won’t be one single solution to this problem, Lesh said, and it’s possible there won’t be any solutions at all. Tony Biasotti is a freelance journalist who lives in Ventura. His work has appeared in the Washington Post, Columbia Journalism Review, Ventura County Star and Pacific Coast Business Times.